Have you noticed how ubiquitous ‘Wild Flower Meadows’ have become? Whether it is a small garden bed, raked over and sown with a wild flower seed mix, or an acre or more of unimproved grassland, summer meadows shimmering with native flowers and buzzing with insects are now widespread; de rigueur even. And quite right too. They have a long flowering season, are full of interest and provide a vital haven for our beleaguered butterflies and bees. That’s a lot of boxes ticked. 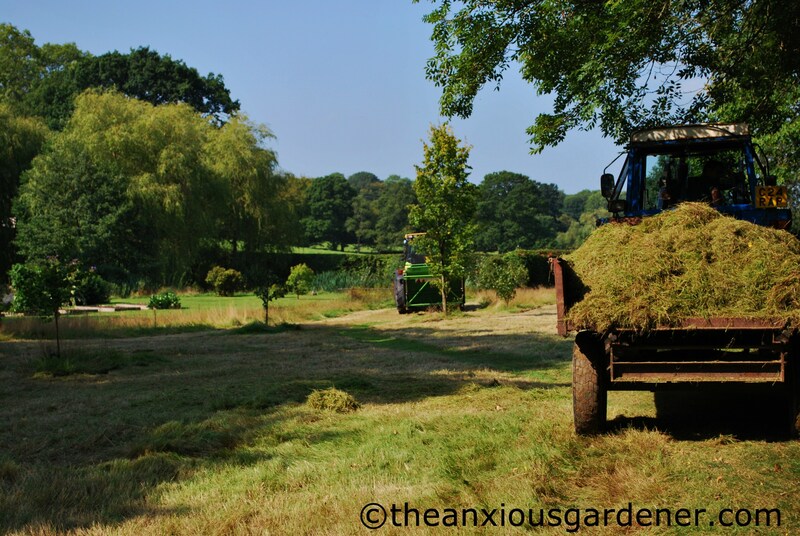 But the big head scratcher (if the meadow is of a size) is the annual summer/autumn cut and the removal of all that mown material. … a waiting trailer. (I had borrowed it and a tractor from Margaret the local farmer). … full, Nick (also borrowed as he can drive a tractor and I can’t) drove up through Margaret’s fields with me perched on top of the hay (as ballast, Nick said). I hummed and I grinned and I enjoyed my Thomas Hardy/Laurie Lee moment. And the hay? We piled that on Margaret’s tottering manure pile. … the result was exactly what I had hoped for. 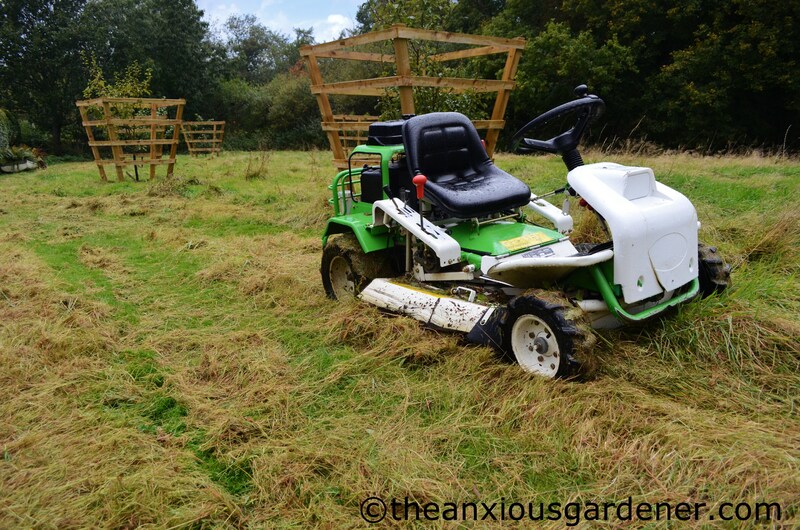 But this year, after weeks of rain and several postponements, I was unable to hire Sam and his massive mowing machine. The huge tyres would have chewed up the spongy meadow ground, like warm toffee. (Poor Sam; it has been a lousy year for him. 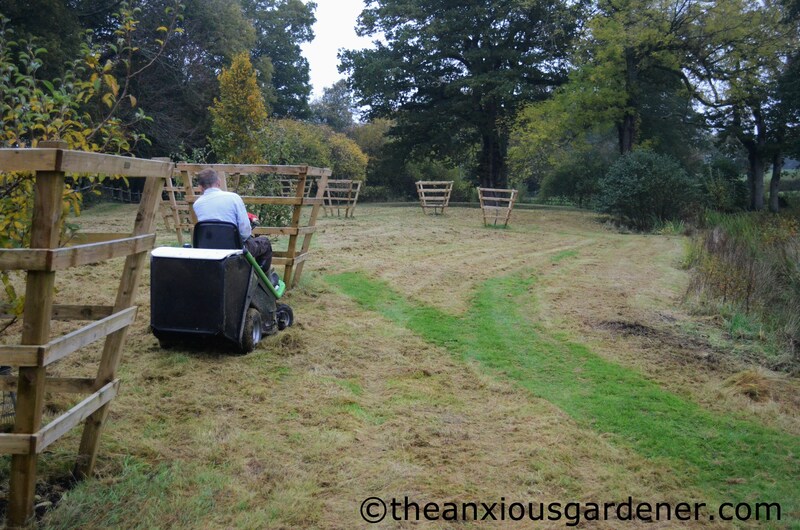 He normally cuts seven or eight meadows but this year he has mown precisely … none). 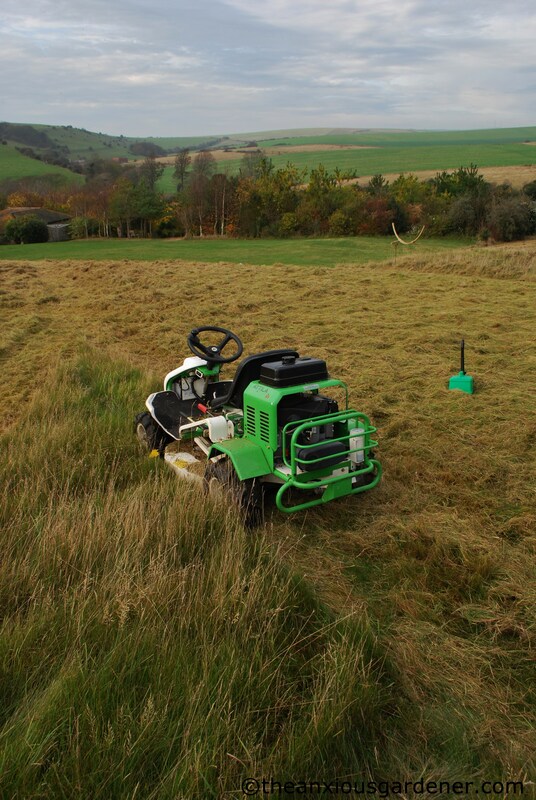 The Attila will cut rough, tussocky grass easily and because of a low slung chassis and wide wheel base it can handle relatively steep slopes, banks and rough ground without toppling over and crushing me. Which is a bonus. It’s a rugged and not afraid of aught little machine. And at £85 for the day, a bargain to boot. The only drawback is that it doesn’t collect the cuttings but spews them out to one side. And so afterwards, Jim and I had to rake up all those cuttings. This was so much fun I could barely stand it. 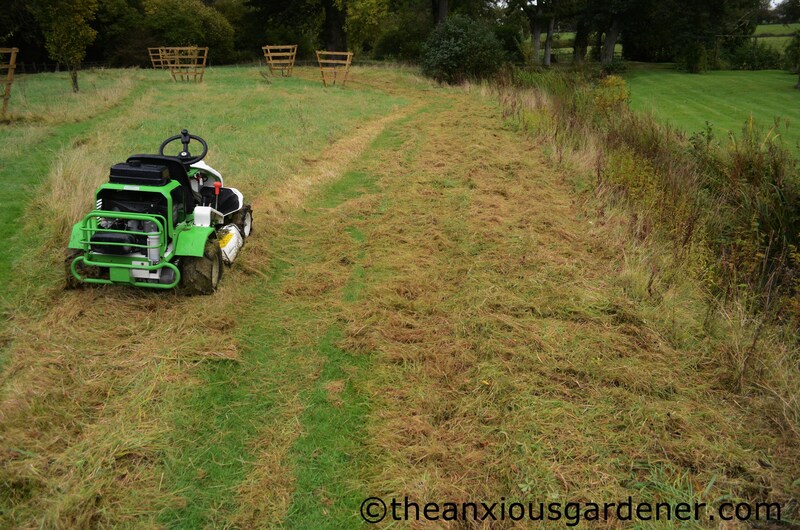 With most of the grass cuttings raked up, Jim was then able to use the Priory ride-on mower (an Etesia Hydro 80 for those of you who care) to cut the meadow grass shorter still and collect yet more of the clippings. 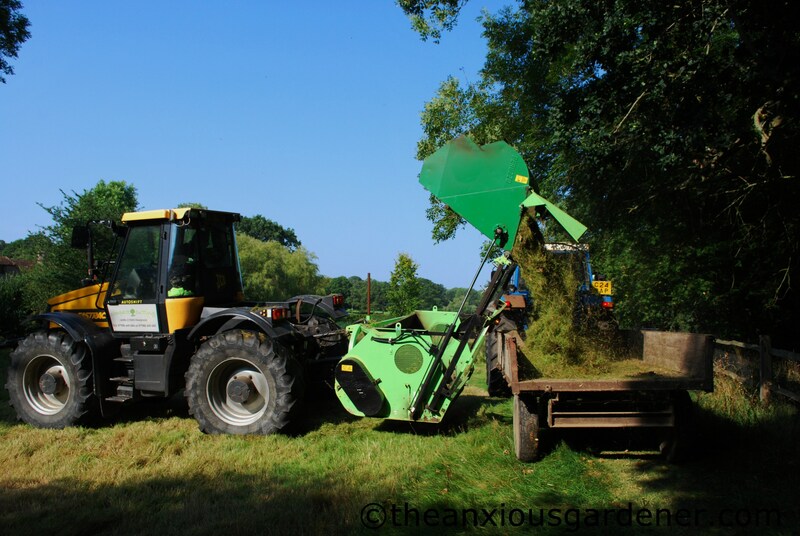 (The more cuttings removed, the more the soil’s fertility will be reduced; to the benefit of wild flowers and the detriment of long, tall, lush grass. But hey! – you knew that). Of course, I still had a problem: what on Earth to do with mountains and mountains of mown grass. Unfortunately, I had no alternative other than to dump them at one end of the meadow. Historically, this is one of the places where my predecessors piled lawn clippings. I would rather have taken them out to the bonfire site and/or compost bins but this would’ve meant repeated driving across soggy, boggy lawns. And this year, that was a mud-churning and lawn-destroying no-no. 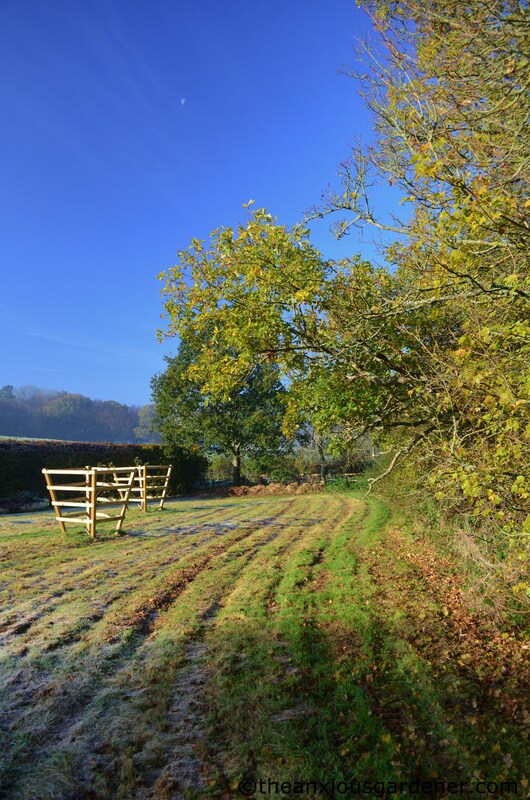 And so the cuttings will just have to sit beneath that oak tree. Can you see them? (And the moon)? In time a bank of nettles will grow over them and within a couple of years the heap will have rotted away to virtually nothing. Honest it will. But it is an unsightly solution and not one I want to repeat. (You can see in this photo how soft the ground is. Even the Atilla and the ride-on mower have left shallow tyre runnels). When dry enough, I shall continue to mow the grass over the coming winter until the first daffodil leaves emerge. In an effort to make cutting the meadow an easier task next year, I’ve just ordered 100g of yellow rattle seed. This grass semi-parasite should (so the theory goes) seriously reduce grass vigour and growth in the meadow. Will it work? Well, I do hope so. I really do. You see, there’s only so much hay raking I want to do in my life. Yep, only so much hay raking I want to do. As fun as it is. Seems like you thrive on hard work David, hope the weather is kinder next year for Sam. Oh, I did see the daylight moon. Reading your link, the gardens and me, glad you found what most suited you, I spent all my life as a motor mechanic and then a shopkeeper, jobs which paid the bills. 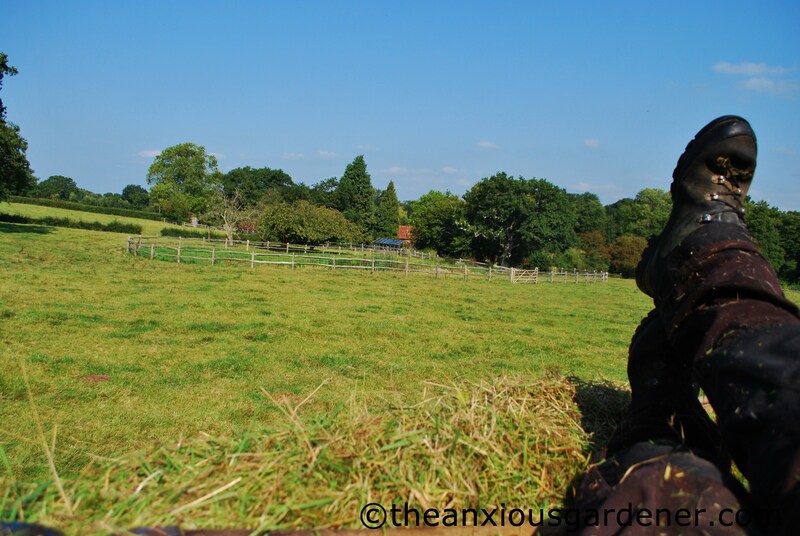 Take it easy, don’t get too anxious, better name for my blog would have been the paranoid gardener. Hi Dave – As you well know, I do the job by burning the cut grass in smothers. 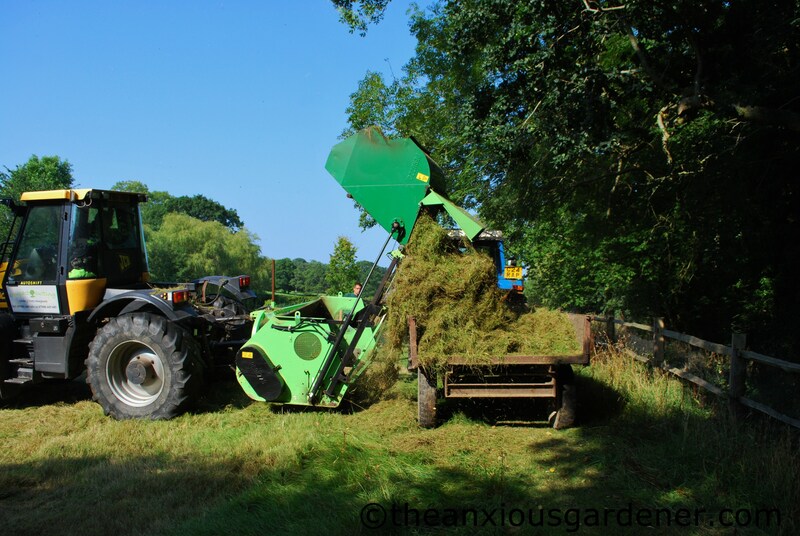 It’s highly satisfactory, and leaves you with a pile of very fertile ash to mix with your compost. 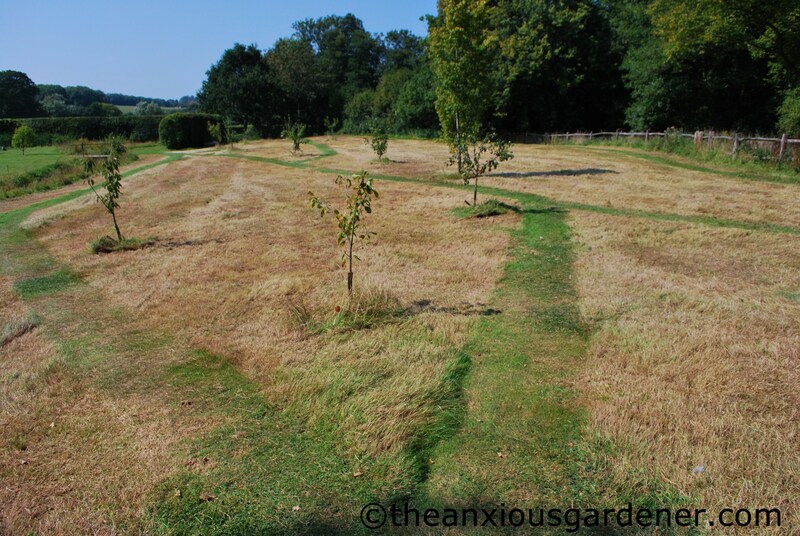 However, you’d need to scythe the meadow (or its mechanical equivalent) as the cuttings thrown out by mowers would not let enough air into a fire. But at least you wouldn’t have a bank of nettles….. The solution is to cut with one of those old-fashioned reapers from before the combine-harvester era….still plenty of them around. Burn in situ, of course then take the ashes off you get a patch of very alkaline bare earth – then a packet of wildflower seed mixed in a bucket of sand…..and you add to the flowering possibilities. That’s the theory; the practice may be different! Exhausting! But at least you didn’t have to use a scythe… And nature will soon reclaim the grass pile. How’s your back? Here’s hoping for a September 2013 with a plethora of perfect meadow mowing days. The last time I went to Harlow Carr garden, the yellow rattle in their wild area was doing a great job. Its an interesting plant and really does take the vigour out of coarse grass. Mowing will certainly keep the brush from gaining a foothold, but it’s too bad it had to be hand raked. i remember the aching arms and shoulders from so much raking, but getting all that nitrogen off a wildflower meadow is a must. And it’s a satisfying feeling to be done with it. 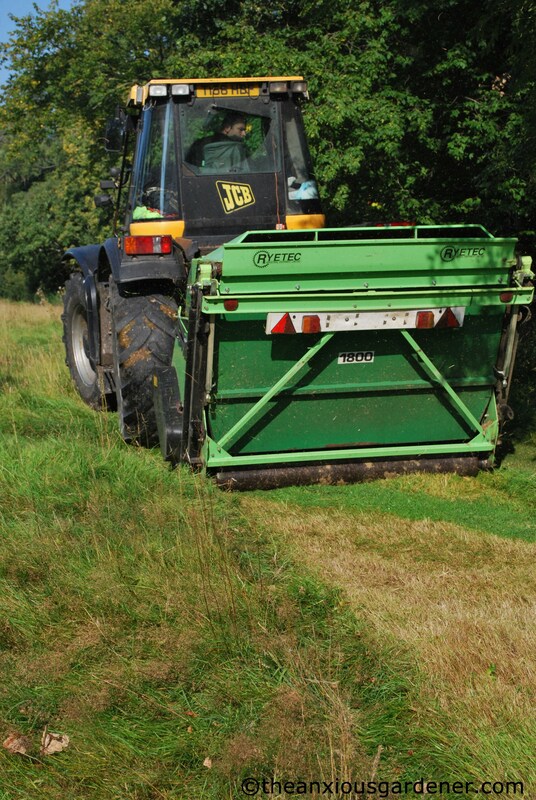 I’ve often wondered what work goes into a wildflower meadow. More than it seems at first glance, which I suspected. I’ve never heard of yellow rattle seed, but would be very interested to hear what you think of it after you’ve used it. 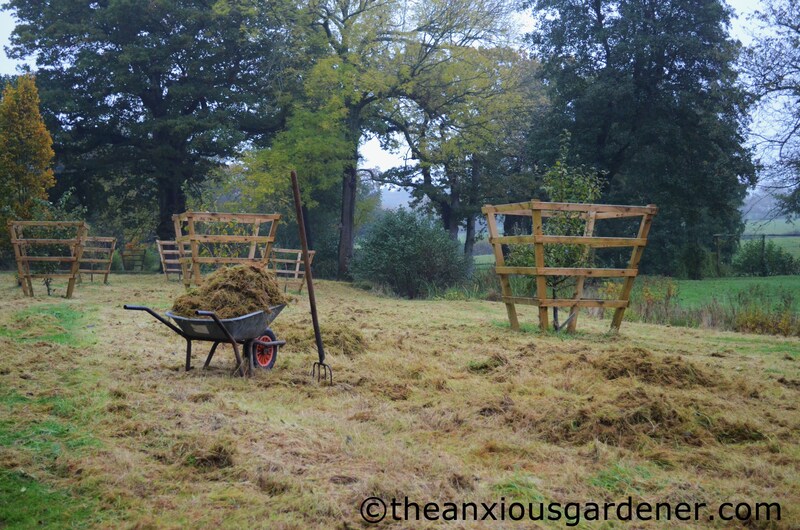 This year is more muck-raking than hay-raking. Poor Sam and his lonely machine. Glad that you found an alternative though, and let’s hope next year is a bit drier! A hard year all round and after the last week one that hasn’t got better. Maybe you could have had a ‘rake the clippings’ party. A bit like a paint the house, house-warming party, only a bit less messy. What a lot of work, but it will be worth it in the spring, honest! 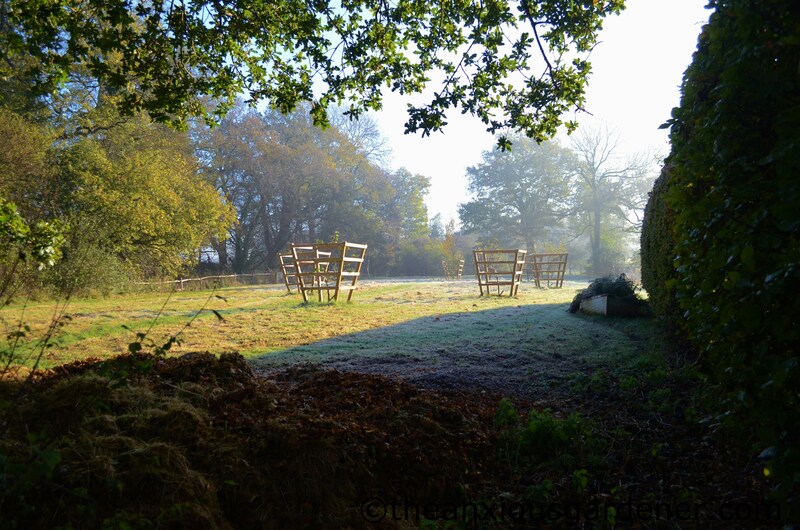 After such awful weather all summer and autumn, its amazing that you got it done Hope you dry out soon and that your meadow is fantastic next year. Such a lot of work. I had always wondered how the wild flower meadows were worked, now I know! Pity that Margaret’s cows are so fussy about their fodder. When we used to pass the silage piles near Aberdeen they had a strong alcoholic reek, Scots cows are obviously easier to please. Good luck with the rattle – that should be worth seeing. Do you realize you’ve got a fantastic Children’s book in the story of “Sam and the Amazing Mowing Machine?” A total NYT best seller!!! You’ve got big farm apparatus, characters with easy names (Nick, Sam, Margaret) and an intro to agriculture…not to mention the socio-economic effect of weather on the priory and surrounding villagers. 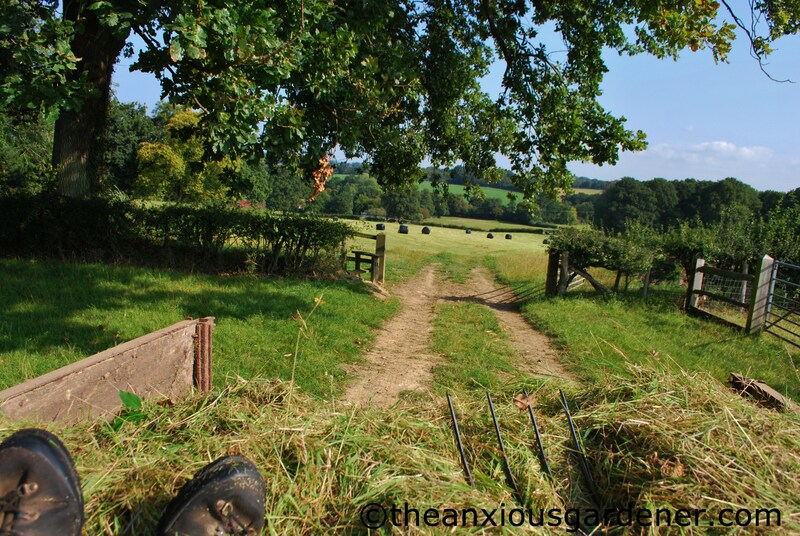 I admire your determination to get the grass mown – for all that you’ve had a rotten time of it – it will surely be worth it come next year when all the flowers spring forth – you get all the best jobs! Wouldnt Margaret’s cattle like the mowings as feed? Isnt that they use for silage? Saying that I know nothing about these things. Attila looks fun to operate, but the raking that followed, I can sympathise…Could be therapeutic though! It’s been such a wet year so I’m not surprised at all that you can’t mow down the grass as you would normally. And cross fingers the yellow rattle seeds would work!